Walking is the new wonder drug. Guess what, you don’t even need Lycra. Whilst at the Otter, why not take part in a short guided ramble around Hadrian’s Wall path. Well behaved dogs are welcome and Cumbria is a great place to explore the outdoors. 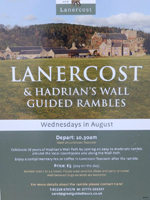 The walk starts at 10:30am, every Wednesday in August at Lanercost order fluconazole 150mg Tearooms, CA8 2HQ. For more information about the walk please contact Carol by email carol@greatguidedtours.co.uk. The Lanercost Priory, next to the Tea Rooms, was not in the Doomsday Book and became part of England in 1158. In its time it was the local economic powerhouse and is well worth a visit.